Inter stars claims to be happy at the club. Tottenham Hotspur target Alvaro Pereira has distanced himself from rumours of a move to the club by claiming he is happy in Serie A, talkSPORT reports. The Inter Milan defender has been a long time target for the North London club and reports recently suggested that a swap deal with Benoit Assou-Ekotto moving in the opposite direction was in the pipeline. Andre Villas-Boas is well acquainted with the 27-year-old, having worked with him during their time at Porto, however, Pereira has stated that he has no interest in joining his former boss in the Premier League. “This is a wonderful team and there are no problems between us. I am a new player in this squad, but I can say the whole club and fans only want one thing – to win. An Inter player must always want to win,” he said. 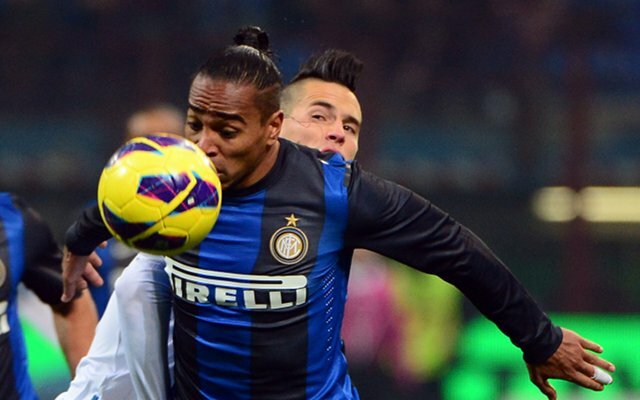 Pereira has been a solid performer for the Uruguayan national side too and since moving to Inter last summer he has made 23 appearances for the club, scoring one goal. In contrast, Essou-Ekotto, who has been linked heavily with a move to Italy at the end of the season, has struggled for form at Spurs this term and a new left back is high on AVB’s wish list. It’s thought that the Portuguese manager will try and use the 29-year-old as a makeweight for any potential new deal.